1. Cook the spaghetti according to the package directions, omitting the salt if desired. Drain and keep warm. 2. Meanwhile, heat 2 tsp of the oil in a large nonstick skilled over medium-high heat. Sprinkle the shrimp with 1/2 tsp of the salt. Add the shrimp to the skillet, in two batches, and cook until just opaque in the center, about 2 minutes on each side. 3. Heat the remaining 2 tsp oil in teh skilled over medium heat. Add the garlic and cook, stirring, until fragrant, abotu 30 seconds. Stir in the tomatoes, tomato paste, oregano, and red pepper flakes; cook until slightly thickened, about 5 minutes. Add the shrimp, basic, and the remaining 1/4 tsp salt; cook, stirring occasionally, just until the shrimp are heated through, about 1 minute longer. 4. 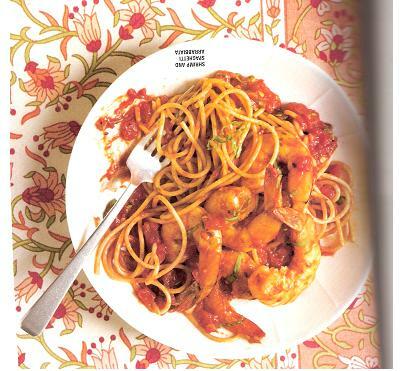 Divide the pasta evenly among 4 plates and top evently wtih the shrimp and sauce. PER SERVING: (1 C pasta and about 1/2 C shrimp with sauce) 367 Cal, 7g fat, 10 g Fib. POINTS value: 7. Tips: I double the sauce. Tomato paste and crushed tomatoes are basically nothing in points, so it makes it more saucey. Also, I leave ou the red pepper--it makes it really spicy.